There is a team aboard the vessel whose job is to map the ocean floor. On this cruise we are diving in known locations but we are also diving in new proposed areas where there is little or no mapping data. This team is a critical component of this mission. Without their hard work we would have no clue as to where we are sending the ROV to search for the target fish species or find very cool benthic invertebrates. The type of mapping they are using is called multibeam mapping. Multibeam mapping has been used for years but the technology and software is becoming very cutting edge. All of the mapping was done at night so my hat comes off to the survey team for pulling a lot of all nighters! The mapping occurs in several stages. First we have to get an idea of what the sea floor looks like. 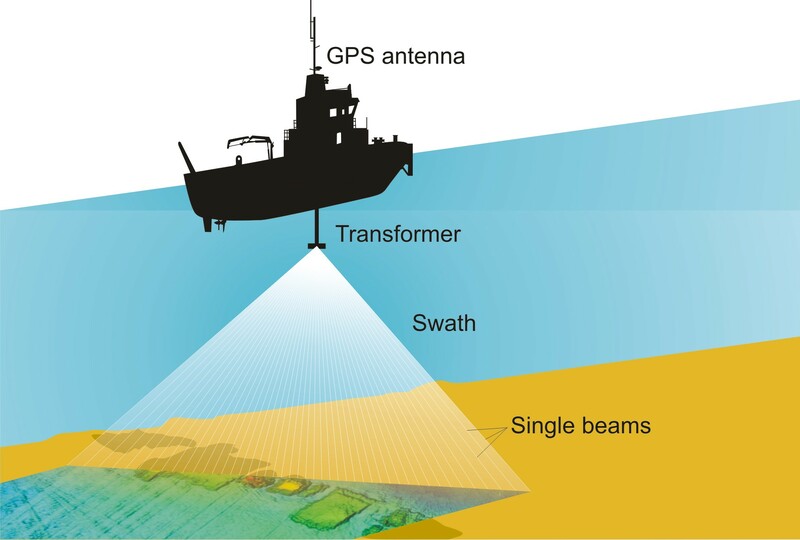 Multibeam mapping uses many signals of beams that sweep the sea floor and bounce back up to the ship. It is a very computer-heavy science. First we need to test the water, literally. 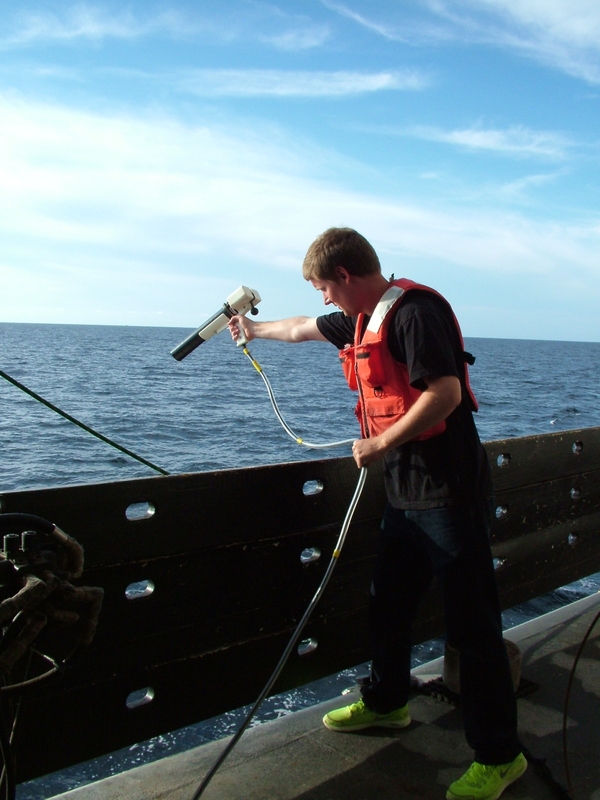 The survey team, consisting of Laura Kracker from the National Ocean Service, NOAA Marine Research Lab, Charleston, SC, Friedrich Knuth from the College of Charleston and Marta Ribera from Boston University, use an expendable probe to test the density of the water. This is important because water density changes due to water temperature and salinity. One the probe is deployed, the survey team can calibrate the beam width to get the most accurate reading of the multibeam signal. Survey team member Friedrich Knuth sends an XBT expendable probe over the side. As the beams travel through the water, sea floor depth is determined by the amount of time it take for the beams to leave the vessel and then come back. The intensity of the sound tells you the probable type of sea floor bottom. The one piece of information that the beams cannot tell us is the geomorphology or the type of bottom features and rock that make up the sea floor. That we can only see through the lens of the ROV but the mutlibeam mapping gives up a good idea of the locations in the MPA that would have the most amount of fish. We want to look in areas of high relief; i.e. rock ledges, rubble, etc., because that is where we will most likely see the target species of fish. At the point that the beams get back to the Pisces, it is still “raw data”. It needs to be processed so that it can be read in map form. This is where the computer programs and the long nights came into play. It is not a simple process. The data is manipulated through 5 programs consisting of many steps to produce a map that can be used in a program called ArcGIS. ArcGIS is a GIS, Geographical Information System, program that is relatively user-friendly, The maps produced during this cruise were amazing. Stacey Harter, the Chief Scientist, used these maps to determine features that the ROV would dive on. The ROV drivers used them to “see” where the ROV was in relationship to those features in real-time. The research teams are able to embed the maps into their cruise notes and cross-reference the maps with still photos. I was truly amazed. 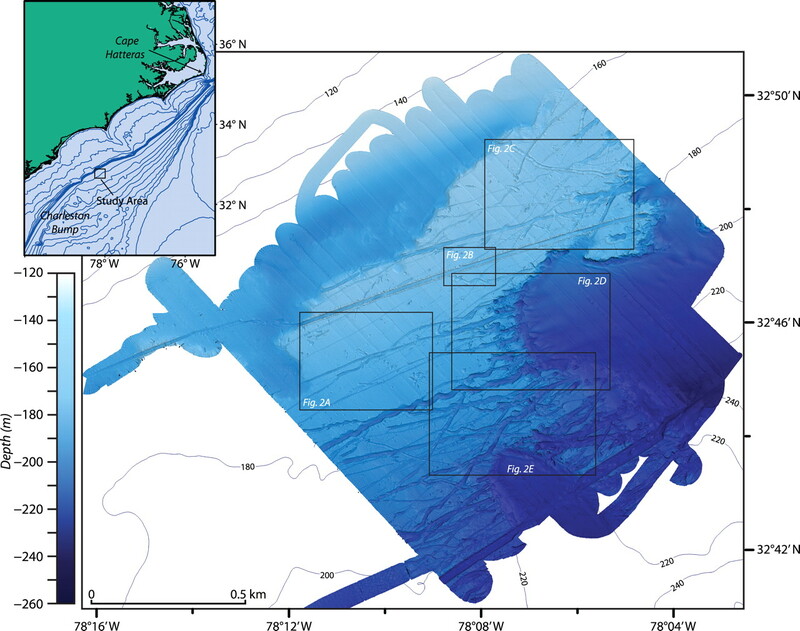 Evidence of ancient iceburg scours off of North Carolina as detected by multibeam mapping Courtesy of NOAA. 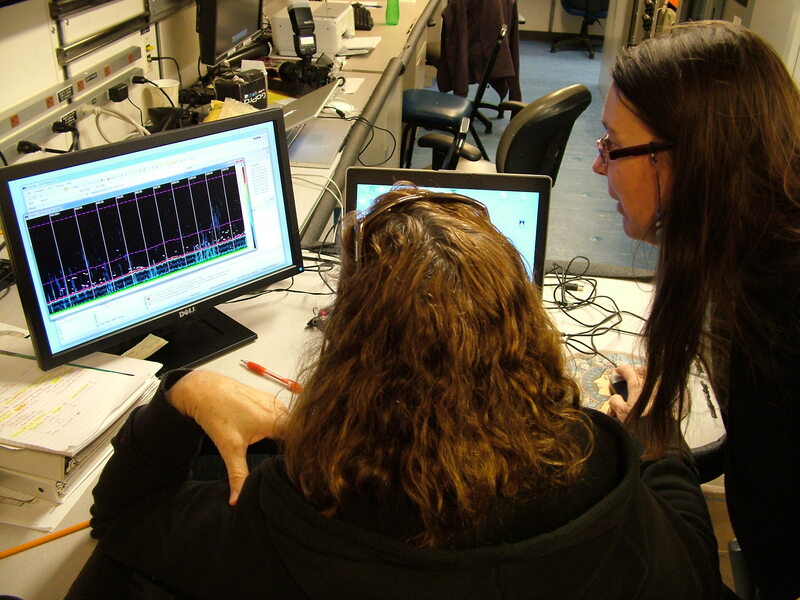 Laura shows me the raw data from the multi-beam mapping. 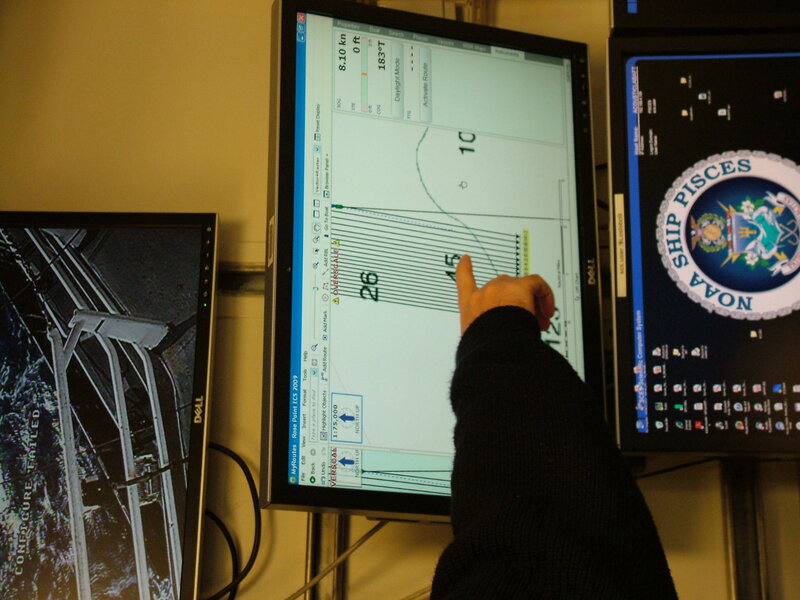 Friedrich points to a monitor that keeps track of the Pisces as it follows grid lines for mutlibeam mapping. 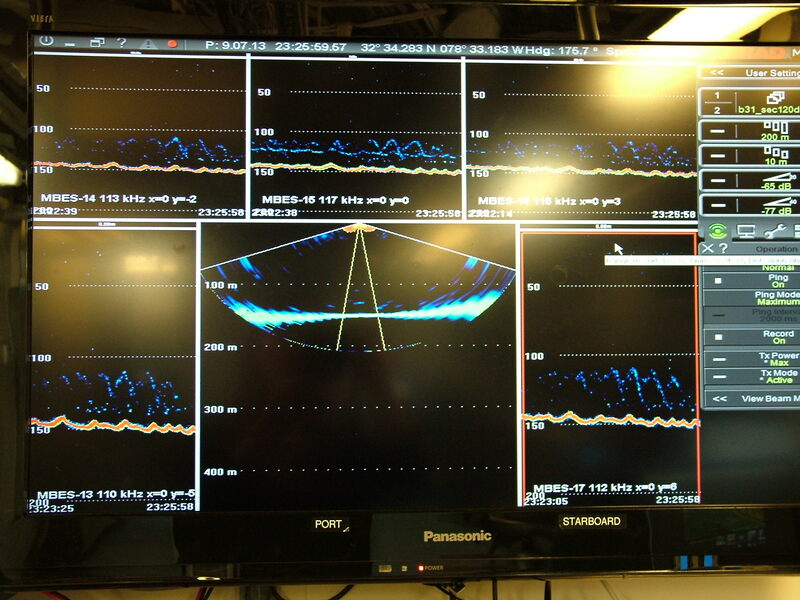 Computer monitor that shows the intensity of the multibeams as they are leaving the ship. I am sad that this incredible experience is coming to an end. I cannot gush enough about the scientist and the crew. I was able to witness a few “firsts” and I enjoyed seeing these scientists, some who have been doing this for 30 years, get excited about seeing something new. I loved how the lab had an open door policy and crew members, from the CO to engineers, would come in and check out what was happening during the dive. If it was after their shift, they would stay for hours. Everyone shared stories and I was made to feel like I was part of the science team. I have a distinct advantage over other Teachers at Sea because I was able to cruise with a team that is located right here at home. I look forward to the possibility of creating a true partnership and bringing NOAA right into my classroom. I have so many ideas for lessons and activities from this experience and have found a massive amount of NOAA resources to use from pictures to data. This has been so eye opening that I am now a big proponent of NOAAs MPA program as I have seen first hand how the closing of these areas has benefited the recovery of fish populations. Me with a sample of Stichipathes that came up in the ROV thruster. Thank you so much for stopping by and sharing in my adventure. Fair weather and calm seas. This entry was posted in 2013, Jennifer Petro, NOAA Fisheries Service, NOAA Teacher at Sea and tagged cutting-edge technology, geomorphology, GIS, multibeam data, multibeam sonar, ocean floor mapping, raw data. Bookmark the permalink.